These red e-bikes look cheerful to me and people who ride them are being kind to the environment and to their wallets. They are electric bikes that are available on demand. The bicycles are power assist so you do need to pedal. The company is called Jump and charges one dollar for fifteen minutes. So you can ride one to a nearby restaurant or wherever and leave it there. To get a ride home you look on your phone app and see where the nearest one is, walk over to it, and you can leave it outside your house for the next person. So two fifteen minute rides would cost two dollars. These in my photo are in a row at a charging station outside the neighborhood library near my house. 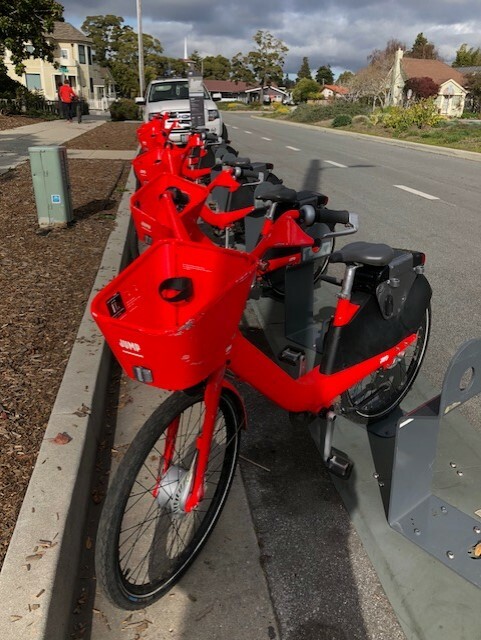 No, I haven't tried them but lots of people are using them and I see riders around town with smiles on their faces. Do you have these or anything similar where you live? Are they popular in Europe, the U.K., Kuwait, the Philippines, South Korea, Turkey, India and Australia? I have blog friends in those areas so thought I'd ask. I have seen something similar in the city, but where I live we don't have anything like that since it's in the mountains :) WHat a fun way to get around. We have Divvy bikes in the city of Chicago. You have to check in periodically and return them to a designated station so they can track them. Here in Chicago, if you didn't do that, they would probably all end up in the lake or something ridiculous. I like that you have the opportunity to find a bike somewhere and grab it. That would be really convenient. Not seen here, but then I am not even on a bus route! Definitely a city or town thing. But an excellent idea. It's a terrific idea and yes, I have heard of it. I like these a lot better than those dangerous scooters they have now. And I love the color, it must make them safer as they get noticed. One can't help but notice them. This is just fantastic! If they are in Chicago, I'd love to know. Wondering if you ride them on the street with traffic or alongside the streets like a bike? Blondie asked where you ride them, and yes, you ride them on the street. Also along the ocean we have a bike/pedestrian path and I think I have seen people riding them there also. I live near the DC agree and there are bikes lined up in bike stands, but I don't think they are electric. But it is a form of transportation that makes sense - especially if you live in a place like DC - and parking a car is problematic! I think it sounds like a good idea. Our big city 1/2 an hour from us, Portland, Oregon, tried some scooters out and to be honest they had a lot of problems with them. People were driving them very fast on sidewalks and narrowly missing people and children, many refused to wear helmets and there were a lot of accidents. But I'm sure there were also many good stories about them, too. We don’t have these bikes in our town, but electric scooters have been an issue in a number of communities west of where I live, closer to Los Angeles — but you probably know about those. . Thanks for stopping by my blog. There's nothing like that here, but what a great idea! San Antonio has scooters. I've heard complaints. They fall or get knocked over and end up in a jumble on the sidewalks causing obstructions to pedestrians, maintenance crews, etc. After we had a wind storm a month or two ago there were piles of scooters all over the place. Those are so neat! I haven't seen them but think they are a great idea! Where's my helmet? heehee! I've never seen anything like these. The bikes are bright and cheerful. Here in tiny town in the Ozarks, they would never work. We don't even have taxi service much less a bus line and the streets are so steep, you would need more than an assist. Still for city navigating, it sounds great and they are so cute. They are so colorful. Neer seen any where we live. Goodness, you could spot those a mile off! 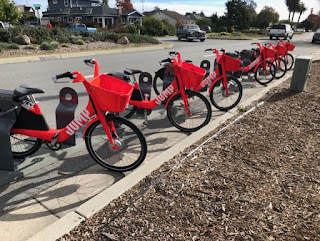 There are no public bikes in our little town but we see them when we visit cities. I haven’t seen these though, only the human powered kind. I’d love to try one! Yes, we have those too. We live in a bay so there is a long flat promenade all the way from end of the town to the other making it ideal for cycling. However from the bay the town just goes up and up! What a great idea. Nothing like that here although the lime e-scooters have started up in a couple of cities with more to follow.